Here's Thunder Mesa's revised track plan showing all the changes that have been made. The town of Calico now plays an important role as one end of the railroad in operations. 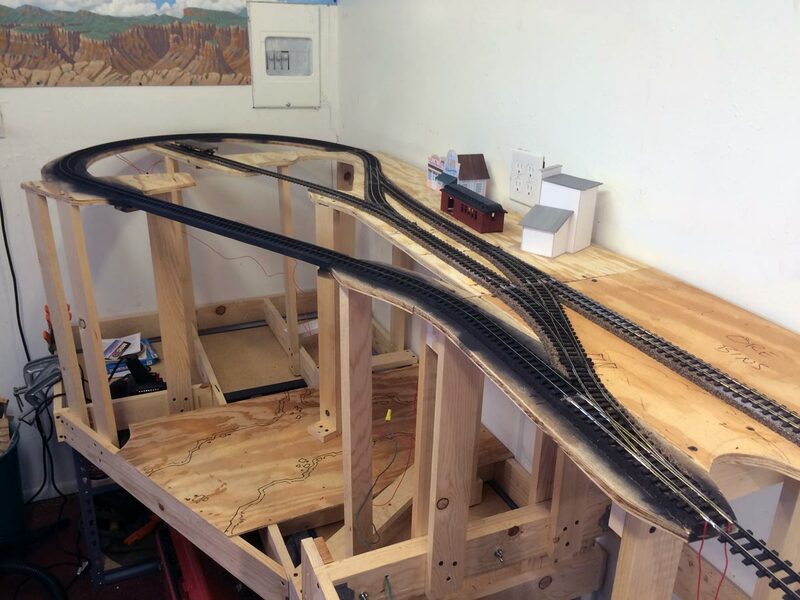 The addition of a reverse loop and short passing siding there now make it possible to operate the layout in a point-to-point fashion. 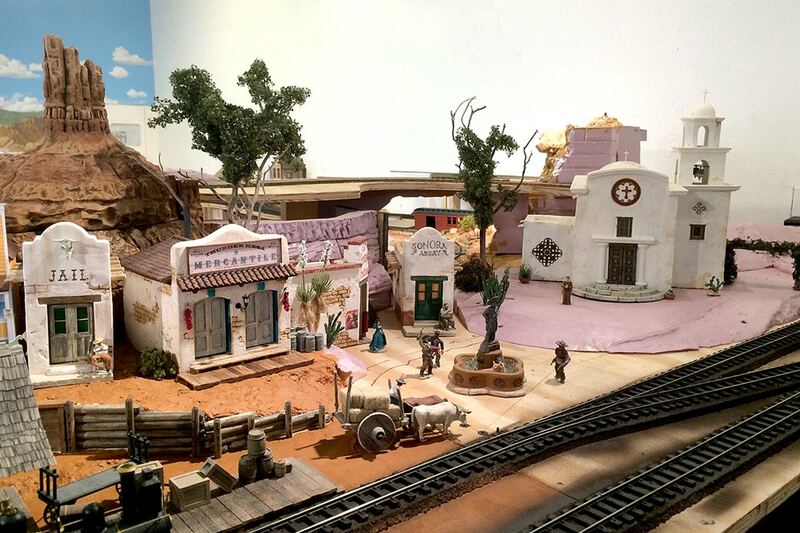 The former village of San Lorenzo has now been incorporated into Thunder Mesa as the "Old Spanish" section of town. This change freed up the far right corner for a turntable and more accessible engine service area. 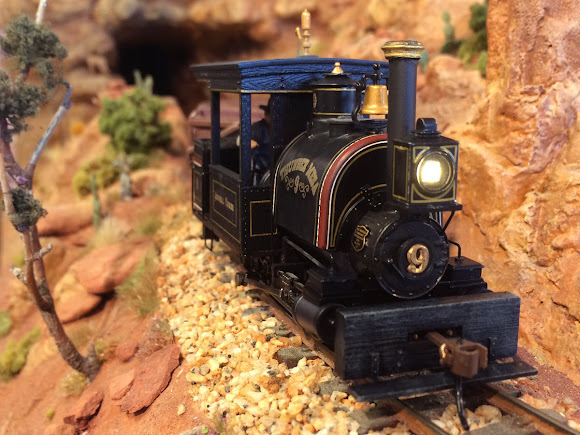 The improved track arrangement at Calico forced my plans for an On18 mini-layout to be shelved (again), but the On18 line does make an appearance as a point-to-point mining tram feeder between Big Thunder Mine and the ore bins at Calico. 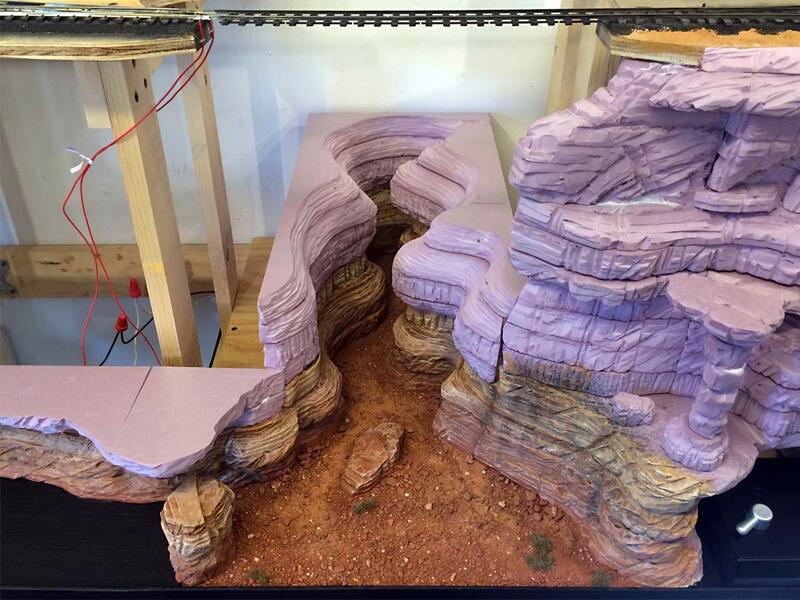 Lastly, the Lone Rock diorama now finds a permanent home on the layout. It's a non-operating scenic feature, but its position against the backdrop offers great sight-lines when looking across the aisle (now called "Coyote Canyon") from the McKennon Arch area. Howdy Folks! So much has been happening out here in Thunder Mesa Country that it's hard to know where to begin. The right of way has been changed, towns have been moved, combined or added, and entire areas have been reimagined. 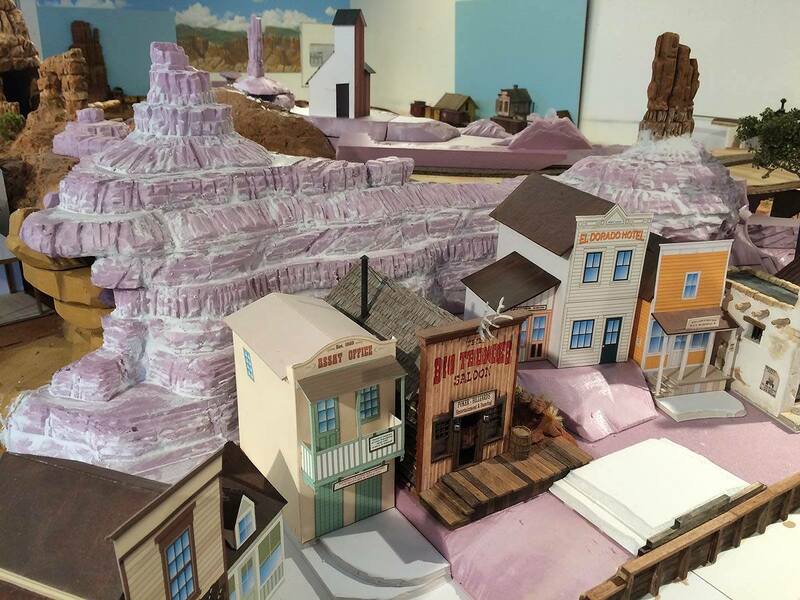 On top of all that, a lot of real progress has been made bringing these changes to life with new scenery work and modeling at Horse Thief Canyon and the town of Thunder Mesa well underway. The best way to get caught up on things is with a new video log. After that, I'll delve more deeply into the details below. 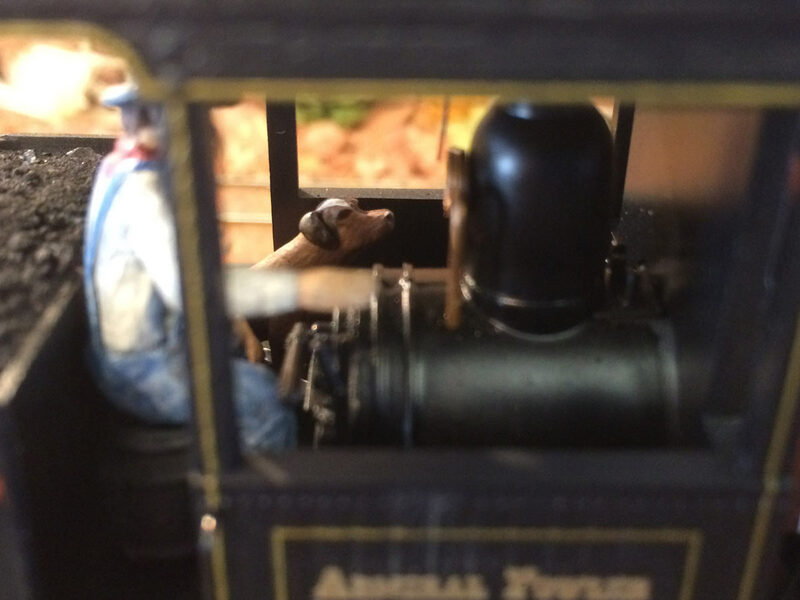 Featured in the new video log is the TMMC's latest locomotive: #9, the Admiral Fowler. 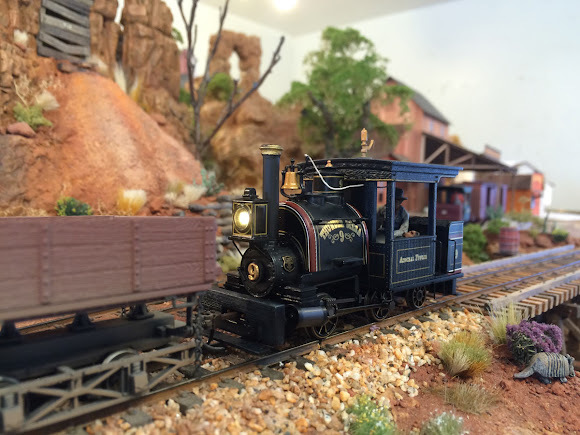 Like several of the other Thunder Mesa locomotives, it's an 0-4-2 Porter from Bachmann. I've dressed it up with a fancy cap stack and some custom decals from Stan Cedarleaf. 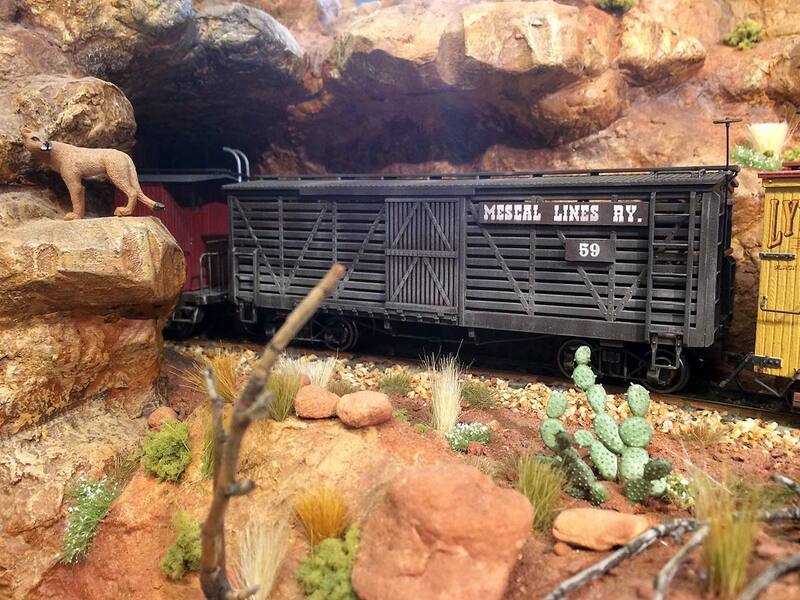 The "Niner" rounds the bend at Dinosaur Gap. The gold capped stack was made from some HO parts in my scrap box. Continuing the Thunder Mesa tradition of naming locomotives after Disney Imagineers, animators and others who played a big role in Disneyland's development, the new Porter is named in honor of Admiral Joe Fowler. This was the man Walt Disney put in charge of Disneyland's construction, and who stayed on as general manager of the park for its first decade. The Admiral Fowler has an unusual crew. The engineer is none other than local legend Chuckwalla Slim, and the fireman is his trusty dog, Sparky. Both figures were painted by my friend, the late Verne Niner, and the locomotive bears the number 9 in his honor. The TMMC has yet to acquire a #8. The new track plan calls for some larger stock pens at Thunder Mesa and that means I'll need some livestock cars. The TMMC doesn't own any itself, but it does interchange with the parent Santa Fe, Denver & Carolwood and that line does run some cattle cars. To represent some of that interchange traffic, I've repainted and weathered a couple of old Bachmann cars for now. Livestock car #59 belongs to the Mescal Lines Ry. Disney Imagineer and well known model railroad author John Olson built his HOn3 Mescal Lines in the early 1980s, and my TMMC owes a very large creative debt to that landmark model railroad. Car 201 is lettered for the TMMC's parent road, the Santa Fe, Denver & Carolwood. 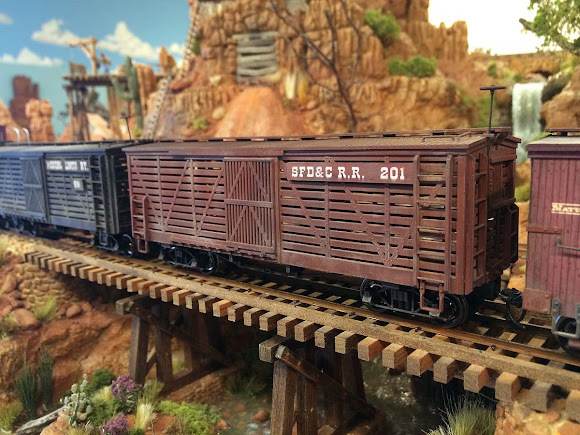 The SFD&C is roughly based upon the Santa Fe & Disneyland Railroad so it seemed appropriate that their cattle cars should bear the same numbering as the original Retlaw 2 cars at Disneyland. The plans for Calico have probably changed more than anything else on the layout. Earlier this year I decided to nix the idea for a mini On18 Calico layout in favor of a reverse loop and a mainline stop at the town of Calico itself. I concluded that the space could be much better used for a second town to act as the far end of the line from Thunder Mesa. This decision also meant that the steep grade up to Big Thunder Mine would have to go, and that the village of San Lorenzo could be incorporated into Thunder Mesa town as Verne Niner had once suggested. But don't despair On18 fans! 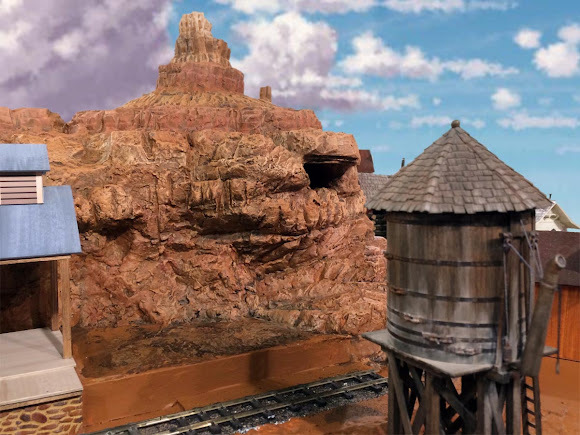 If you take a close look at the plan above, you'll see that the old Big Thunder high-line will now be an On18 mining tram bringing ore to the bins at Calico. Quick thumbnail sketch for the grade changes at Calico. The reverse loop is controlled by an MRC DCC auto reverse module hidden below decks. Before his untimely passing late last year, Verne Niner and I discussed several different options for integrating his award winning San Lorenzo diorama into the layout. One thing he had suggested was making San Lorenzo the "Old Spanish" section of town. I immediately liked that idea since it implied a long and rich history for the town. 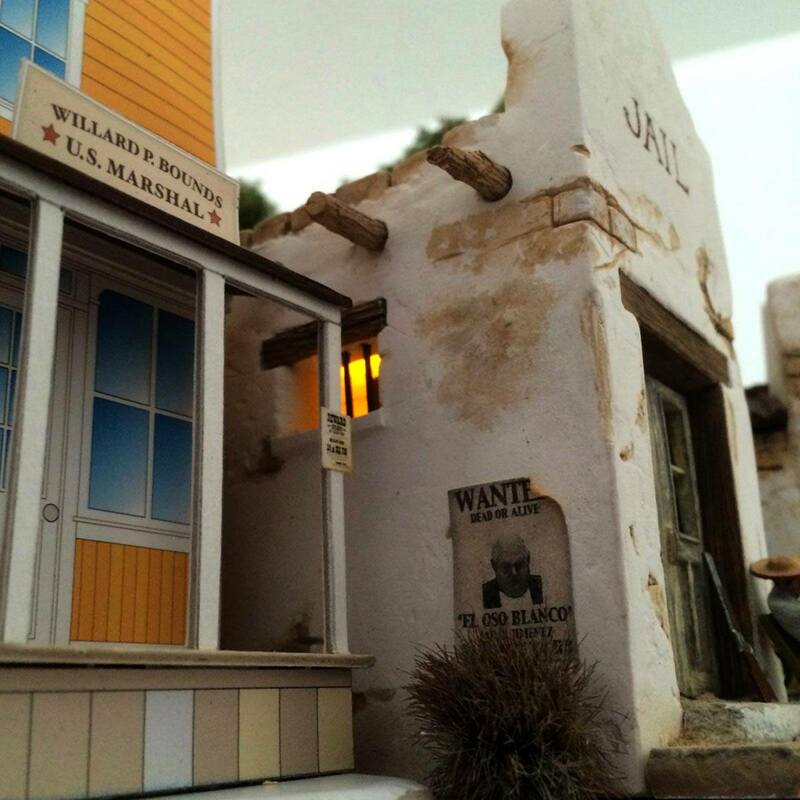 It's something you see a lot in the older towns of the Desert Southwest, where Native American, Spanish, and Anglo cultures all come together and overlap. 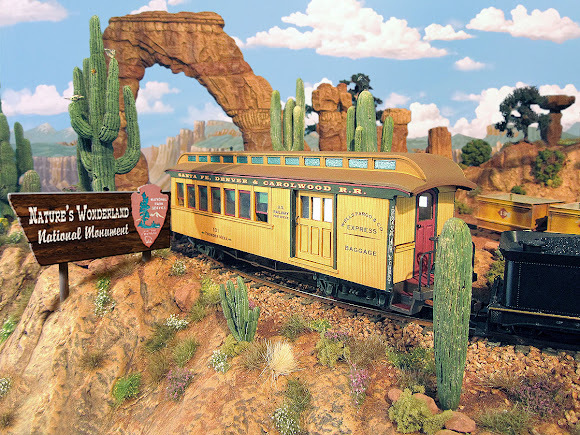 Still, I was hesitant to alter Verne's beautiful diorama until I came up with the new operating scheme placing Calico at one end of the line and Thunder Mesa at the other. Now there was no reason (or room) for a third town on the layout and I found myself thinking back to our early conversations. The decision made, I carefully disassembled the diorama, cataloging everything in pictures, and managed to save every last detail except for the bead-board foam base. In their new placement, the adobe structures have a somewhat different orientation, but their positions from left to right are the same. Several of the structures also have new foundations at differing heights to better compliment Thunder Mesa's boomtown aesthetic. Adding lighting to the structures was always on my to-do list and this move seemed a logical time to also move forward with that project. The San Lorenzo structures in their new locations as the Old Spanish section of Thunder Mesa. 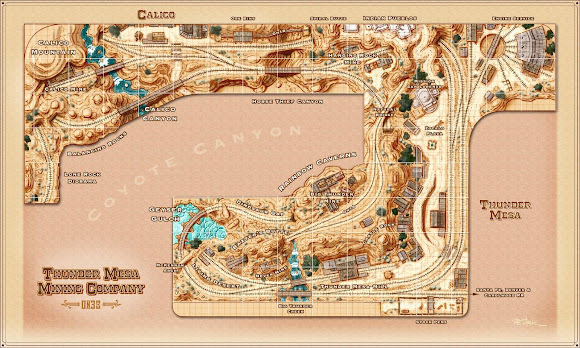 Disneyphiles may also notice that this arrangement mimics the orientation of Rainbow Ridge to the early California flavored area of Zocalo Park at Disneyland (former location of Mineral Hall and Casa de Fritos). This is no accident and the fountain area here is now called "Zocalo Plaza." LED lighting has been added to the jail. 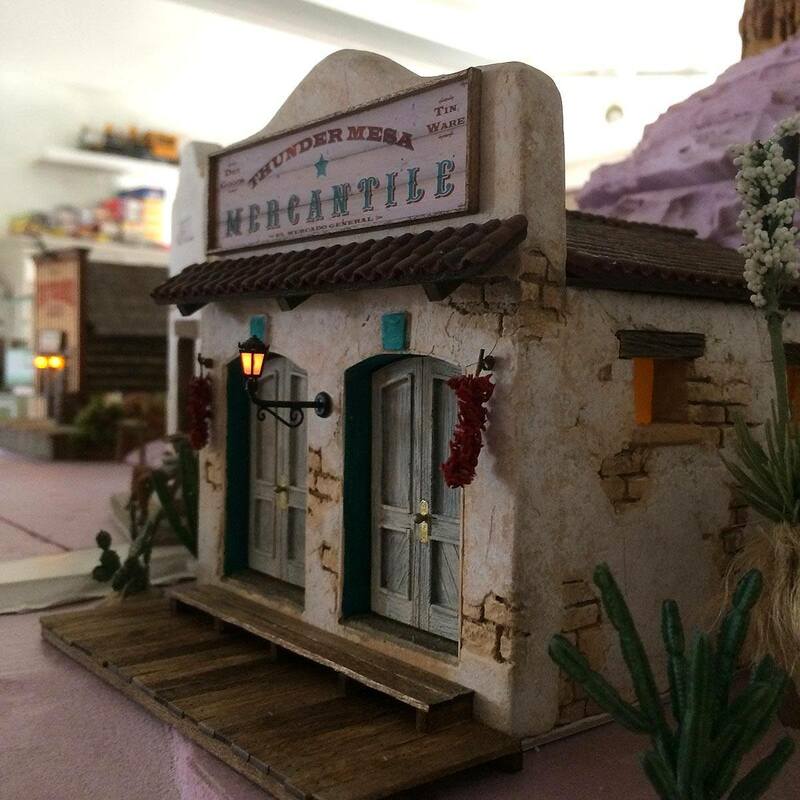 The Mercantile has also received LED lighting, along with some new signage and a wooden front porch. One more thing that remains intact from the original diorama is the Pricom Dreamplayer sound system. The mission bells ring, chickens cluck, horses whinny, and the angry banditos still threaten the pig bathing in the fountain. It's a wonderful scene, and I think fondly of Verne every time I look at it. With the San Lorenzo structures becoming part of Thunder Mesa, it seemed like a good time to tackle some of the scenery work around town too. The new rockwork that forms a backdrop for the town was built and finished with the same techniques I've been describing in the step-by-step build of Horse Thief Canyon. With the rock and paint work done, I've since moved on to building all of the retaining walls, board sidewalks, and steps through town. The rockwork behind town was built up with carved layers of extruded polystyrene foam. The layers were then blended together with spackling compound and Sculptamold. 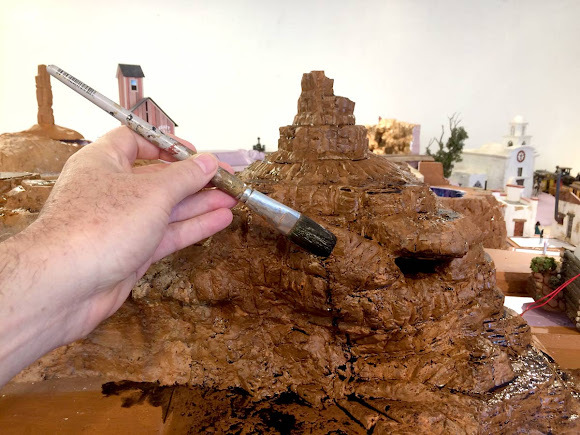 Once the sculpt is complete, the rocks are painted with latex and acrylic paints. Here I'm applying a wash of diluted black to darken the cracks and crevices. After final paint and with a backdrop in place the scene starts to come together. This new promontory above town is called Castle Rock. Just below that is Injun Joe's Cave, where, as legend has it, lost Spanish gold is still waiting to be discovered. Here's an overhead view of the new board sidewalks and retaining walls built in town. And a view from the depot platform. The timber retaining walls help to separate the depot scene from the town beyond. One by one, each of the paper and cardstock mock-ups in town are being replaced by fully detailed models. It would be much more difficult to plan a scene like this without them. The Marshal's Office will likely be my next structure project. A quiet night in Thunder Mesa Town. Soon, ground cover, weeds, and other details will be added to further enhance this scene. With the San Lorenzo structures moved to the other side of the tracks, that freed up their former location for an expanded engine service area with much improved access. The centerpiece of this scene will be one of the excellent turntables from Kitwood Hill Models. I'll be building the 9" gallows turntable here, and when completed it will allow the layout to operated in a point-to-point scheme between Thunder Mesa and the reverse loop at Calico. 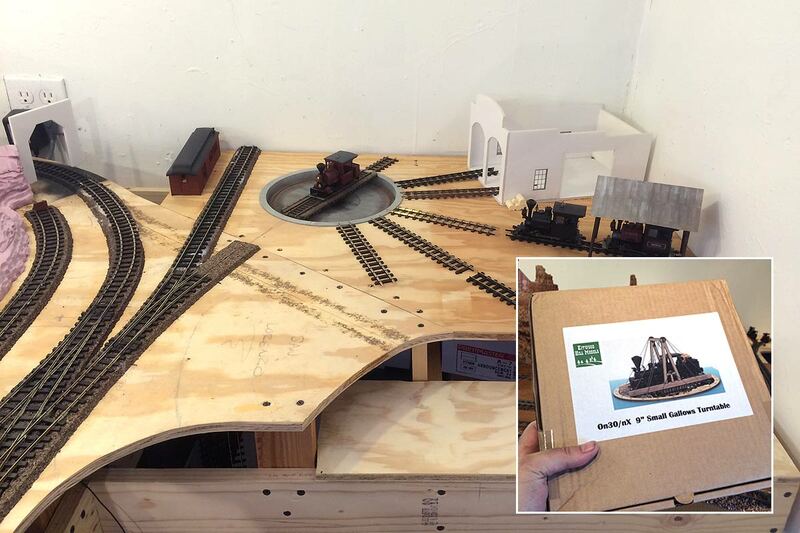 The new engine service area and an inset of the Kitwood Hills Model turntable. Can't wait to get started on this terrific kit! Meanwhile, progress also continues a-pace at Horse Thief Canyon. I'll continue to update the build of this scenic slot canyon in its own step-by-step series. Horse Thief Canyon - nearly 75' deep below track level. The mainline will cross here on a classic deck-truss bridge. 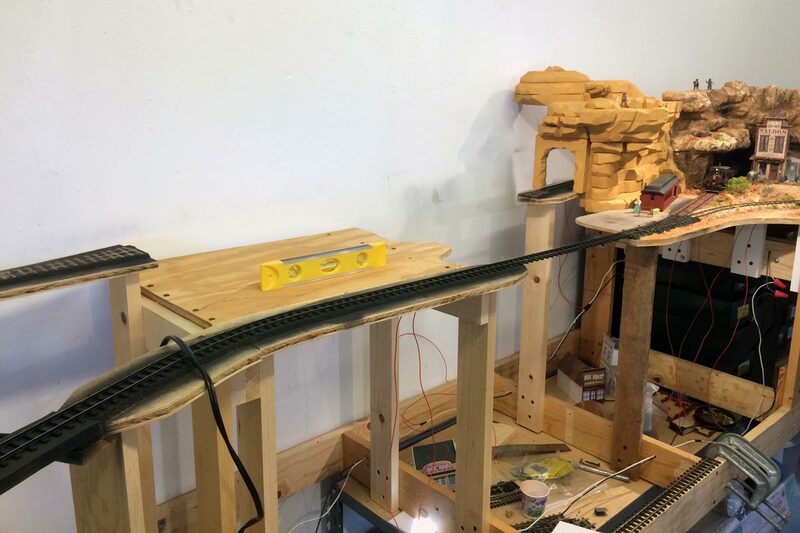 Each section of the layout will eventually have its own small panel for controlling lights, sound effects, music, and animation. The first such panel is now complete for the Thunder Mesa section. This small panel was built into the layout fascia on the Thunder Mesa section. The panel face was created in Photoshop, printed on cardstock and laminated with a matte finish clear acrylic. This was then affixed to 1/8" thick masonite. The functions are controlled by simple SPST on/off switches, and a green LED indicates power. 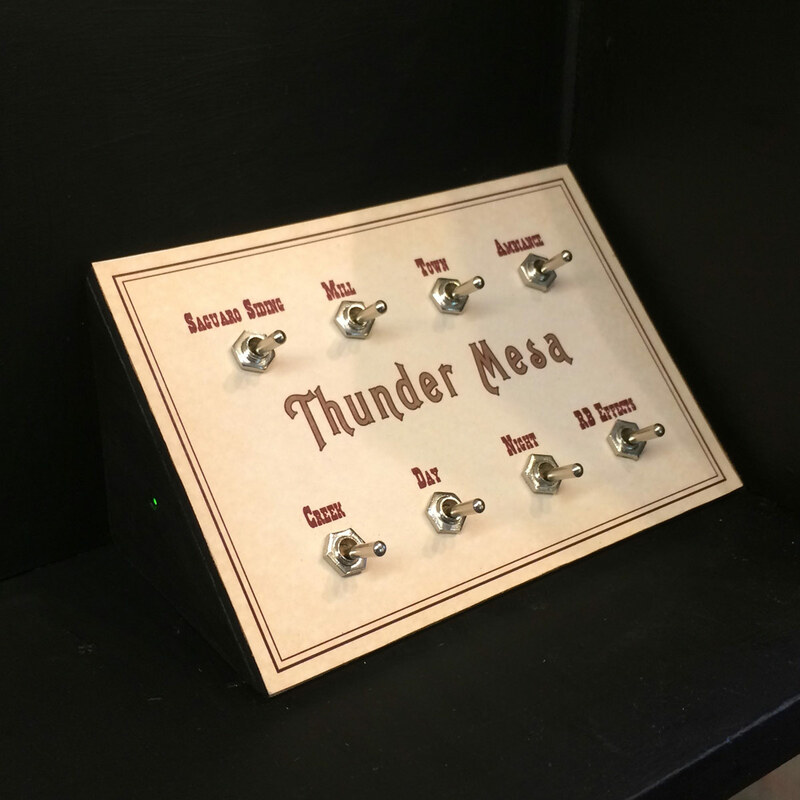 All of the effects on Thunder Mesa run on a 9 volt DC system. Every land at a Disney park has its very own soundtrack, usually a one hour music loop that helps to reinforce the land's theme and further immerse guests in the experience. 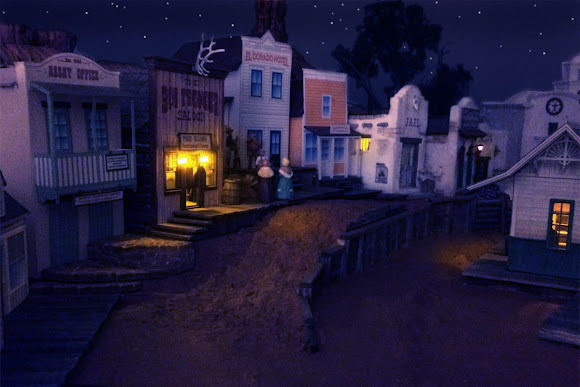 I've always enjoyed the music played in Frontierland and thought it would be a kick to add it to the railroad. I put together my own extended loop that also includes music from the Big Thunder queue and Big Thunder Ranch (now gone!). The music is provided by an inexpensive MP3 player and piped in through speakers hidden under the layout. The first 3 months of 2016 have been a very busy time on the railroad but with each project completed I see three more that still need doing. 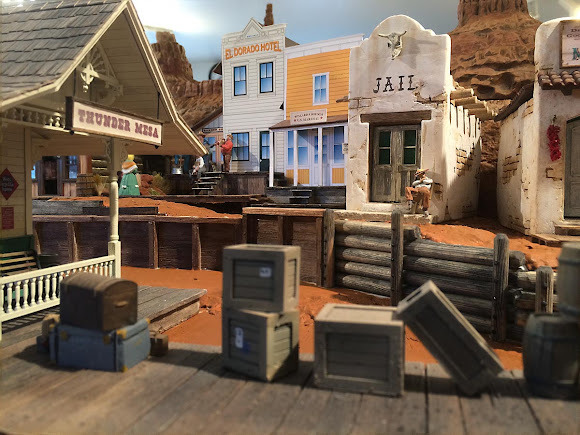 Coming soon will be new structures for Thunder Mesa Town, ore bins for the On18 line in Calico, a build of my Kitwood Hill Models 9" gallows turntable (can't wait to get started on that one! 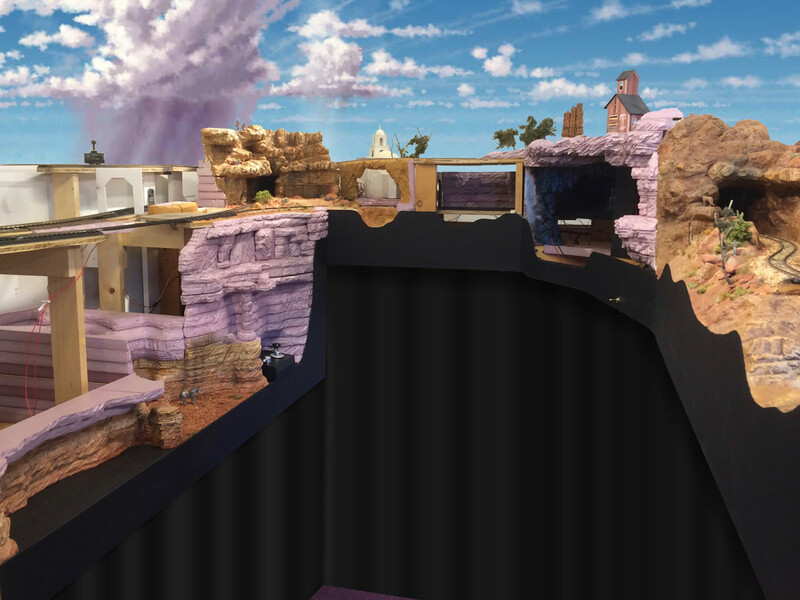 ), some new scenery and effects for Rainbow Caverns, a backdrop to install, and Horse Thief Canyon to finish. All that and more should keep me busy through the end of the year. A look ahead at the future through the magic of Photoshop. This is the view standing in Coyote Canyon and looking toward Big Thunder Mine and Rainbow Caverns. Horse Thief Canyon is at left and Dinosaur Gap is on the right. The Indian Pueblos will be right about where the thunder storm is on the backdrop. I've also imagined some black drop curtains down below the fascia to give things a more finished look. 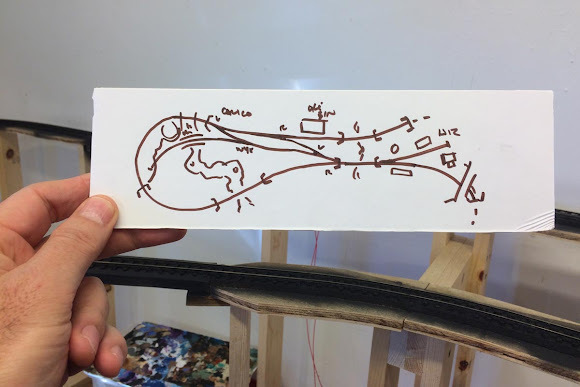 Though work on the layout has been steady, I haven't had the time to update this blog as often as in the past. Going forward, look for more long posts like this one to come out every few weeks or so, and for more frequent posts (sometimes several a day! 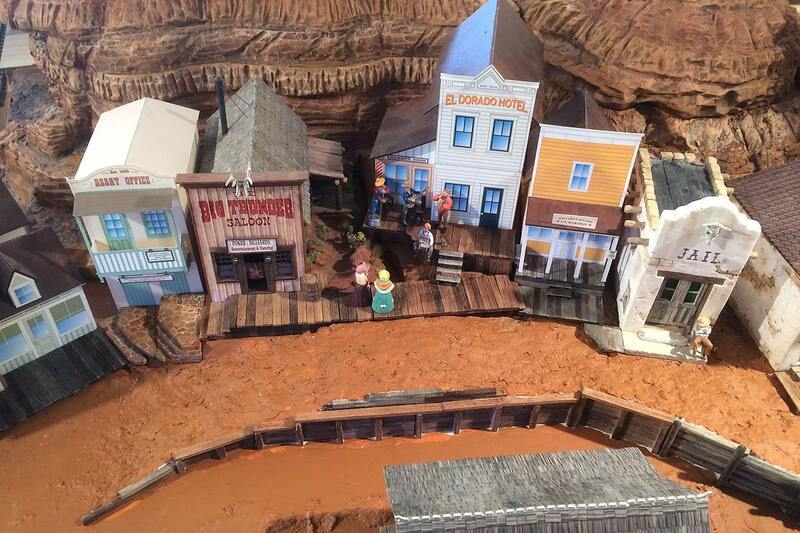 ), head on over to Facebook and follow the Thunder Mesa page there. As always, questions and comments are welcome below. Thanks for checking in, amigos. Adios for now!